Etiquette is incredibly important to the Miao people and certain customs must be adhered to, particularly when it comes to welcoming guests. Guests who have travelled a long way are given what is called “horn spirit”, which is a locally distilled alcoholic spirit that is specifically reserved for special occasions. 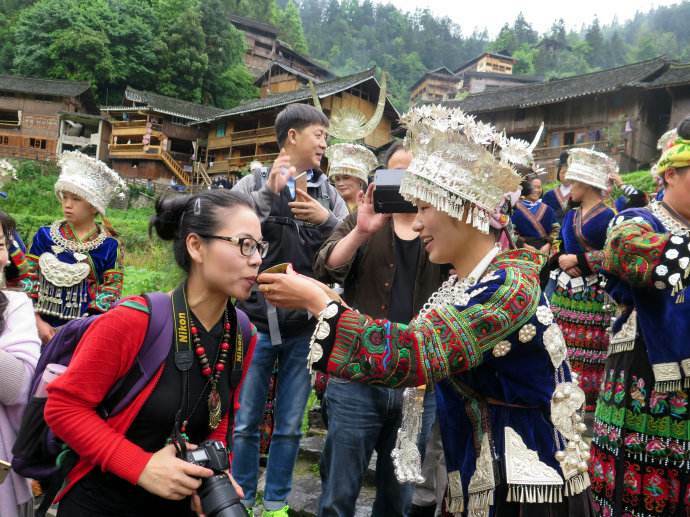 If you visit any of the larger Miao villages, such as Xijiang, during national holidays or festivals, then you’ll be treated to this ceremony and be invited to try the “horn spirit”. Traditionally Miao people will receive any esteemed guest by slaughtering one of their chickens for the guest to eat. This is followed by a custom known as the poultry ceremony. In this ceremony, a chicken is killed, cooked and distributed in a specific way. The head is given to the eldest person in attendance and the leg is given to the youngest. The heart is then presented to the guest of honour by a senior member of the host family, who holds it delicately in their chopsticks. The guest must then share the heart with the person who presented it to them. This gesture illustrates how many of the Miao customs have been developed with the aim of bringing Miao communities and clans together. 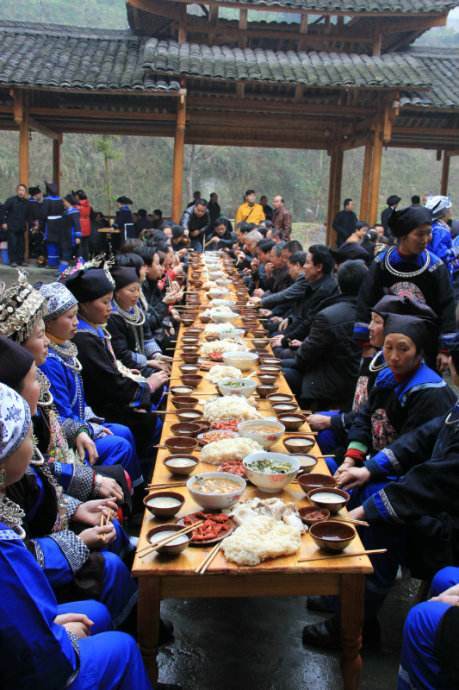 It is important to note that, unlike in Han Chinese culture, it is considered very insulting to overeat in a Miao household if you are a guest. It is better to excuse yourself from eating when you are full, rather than trying to eat too much. When a married woman returns to her parent’s home to visit or when other family members come to visit, they will carry a chicken, about 2 to 3 litres of glutinous rice, a large piece of salted or fresh meat and a fish. These gifts are often simply referred to as a “mixed bundle”. When the guests arrive, the host family will call upon all of the cousins, paternal family members and members of the village to unwrap the bundle. They will all drink liquor and have dinner together. 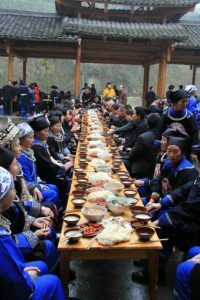 The dinner will be made up of the delicacies that the guests have brought and the glutinous rice will be shared with all of the members of the village. On the second day through to the third or fourth day, the families who shared the food that the guests brought should in turn invite the guests to their house to eat. The guests will normally visit between four to five families per day, but will always have dinner at the host’s house. This custom is called “disturbing the village” and has been practised since ancient times. It is an important ritual for improving bonds between distant members of the family. When the guests leave, the host family and anyone who shared the food they had brought should send gifts to them. After the guests have left, the host family will leave their door open until the guests are long gone, in order to show the guests that they are always welcome to come again. As the guests leave the village, the host will see them off. Traditionally the host must lead them along the main road instead of a smaller path, which symbolically means they are wishing their guests a safe journey home. When a guest of significant importance leaves, all of the paternal family members and villagers will see them off. The women will adorn their shoulders with colourful cloths to express good will and the guest should wear these cloths until they get home out of politeness. The women will then propose toasts to the guest and sing what are called “flying songs”, or seeing off songs, loudly and clearly. The guest will then respond with their own song before departing.